Pittsburgh Pirates is one of the most successful teams of the Major League Baseball. The team is based in the industrial heart of America, Pittsburgh, Pennsylvania, and plays in the Central Division of the National League. Also known as the “Bucs” or “Buccos”, the Pirates have won the World Series Championships five times. 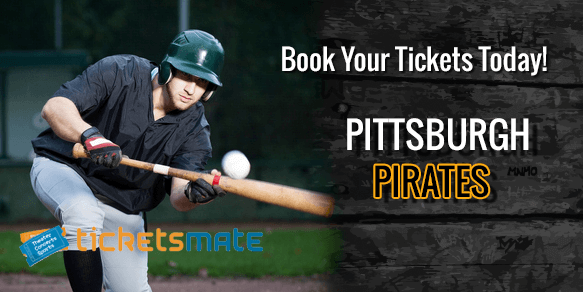 Get your Pittsburgh Pirates tickets to watch the competitive team that has been part of the league since 1887 and has given some of the best baseball games to its fans. The Pittsburgh Pirates kicked off their 2018 season at the end of March at the Comerica Park. So far, the Bucs have played 92 games and have won 43 of them. Their winning percentage is currently 46.7% (as of games played till July 11, 2018). As the team now sets eyes on its upcoming games with the Brewers, fans of the team are following the Pittsburgh Pirates schedule intently, in order to not miss anything! Started in 1882, the Bucs joined the National League in 1887. The Bucs weren't always called the Pittsburgh Pirates though. There original name was the Pittsburgh Alleghenys, named after the Allegheny River of Pittsburgh. They 'became' Pirates for the 1891 season and this name was printed first on their uniform in the year 1912. The team has never been static when it comes to its uniform and innovation has been the name of the game. It has changed over time and the only constant is letter "P" as a logo on the team’s cap. The ever evolving Bucs have also moved away from the patriotic trilogy of colors (red, white and blue) and have adopted the present black and gold colors, matching the colors of the Flag of Pittsburgh. The team could also be credited for being a trend setter when they adopted sleeveless jerseys as part of the uniform. Sticking to the uniform, their hat remains a hot item on the throwback market. The team's official mascot is the mighty Pirate Parrot whose height is said to be larger than life and whose weight can’t be accurately measured since he won’t sit still on a scale! However, he is at his best when the team is playing in its home ground, the state of the art PNCPark! With 38,362 seats, and built with total cost of $262 million, this has been the fifth home ground of the Bucs since 2001. The team’s previous home grounds were RecreationPark, ExpositionPark, Forbes Field (the Bucs played there longest tenure here with 61 seasons) and the Three Rivers Stadium. The Bucs won their very first World Series in 1909. The ball started to roll for them after that. With further World Series wins in 1925, 1960, 1971 and 1979, the Bucs have never looked back. With a winning mindset ,the team has been the first team to win a World Series on a home run in 1960. The Bucs and the Philadelphia Phillies game in 1921 was the first ever major league baseball game to be broadcasted on radio. They became the first team to permanently wear batting helmets both during the offense and the defense. Further, they were the first team to play World Series night game at Three Rivers Stadium in 1971. The Pirates were the first team to have an all minority lineup in the history of major league baseball. Legends like Roberto Clemente and Willie Stargell were part of the lineup. Staying true to their 'doing it first’ culture, the Bucs signed two Indian players, Rinku Singh and Dinesh Patel. Signing up the Indian players was deemed by the team management as tapping into the untapped market and potential. The Pittsburgh Pirates became the first team to recover from a deficit of 3-1 games in winning a best of seven World Series. The list of Pittsburgh Pirates Hall of Famers is long with legends like Jake Beckley, Max Carey, Fred Clarke, Roberto Clemente, Barney Dreyfuss, Ralph Kiner, Willie Stargell and Bill Mazeroski along with many more. Milo Hamilton and Bob Prince have been the recipients of the prestigious Pittsburgh Pirates Ford C. Frick Award. The Bucks aren’t just a team, they are an institution, and an integral part of the community around them. Along with adults, kids are one of the biggest fans of the team. Bucaroos Kids Club is for kids aged up to 14 years and offers special benefits to its members. Kids and their parents can also celebrate birthday parties at the PNCPark, home of the Pittsburgh Pirates. Pirates 2011 Lady Bucs Club offers special benefits to its female fans. In addition to the fan clubs, the Bucs run Pirates Charities, which has decided to build Miracle League Field for Manatee and SarasotaCounties in partnership with Miracle League of Manasota, which would enable local special needs children to play baseball. Since the Bucs aren't just a team but a community in itself, it is time to support your own community by buying the Pittsburgh Pirates Tickets. Pittsburgh Pirates are early starters; they won their first World Series title in 1909 when everyone thought they are too new to achieve it. Currently they own 9 East Division titles, 9 National League Pennants and 5 World Series titles. Rivals and critics might think that Pirates aka Bucs are deteriorating but the truth is that their survival strategy is to attack when enemies are least expecting it. The fans of course never stop expecting smashing victories from them and for exactly the same reason their turnout never falls short. Pittsburgh Pirates Tickets are up for grabs, book them ASAP. The Pittsburgh Pirates did not have the best of times last season. They failed to make it to the postseason for the first time since the year 2012. They also posted their first losing season since 2012. The Pirates came in third but it wasn’t all gloom and doom for them. Starling Marte and Mark Melancon made it to the NL All-Star team. Not only that, but Sean Rodriguez and Jung-ho Kang made it to the NL Player of the Week in September. The franchise’s coaching staff has made some changes too now. Andre McCutchen will move to the right field while Marte will play in the center. Gregory Polanco will go from right to left to take over the position vacated by Marte. It will be really interesting to see how these players tackle the change of positions. The Philadelphia Phillies and Pittsburgh Pirates rivalry is considered by some to be the most intense one in the National League. Things were bound to heat up when the Pirates entered the NL in 1887, four years after the entry of the Phillies. In a total of 2,279 meetings, the Pirates lead the records 1,216-1,063. The records for the last three seasons, including 2018 games, are also in the favor of the Pirates, with a record of 14-7 as of now. Some may say that this classic rivalry is dead, but fans of the Pirates and Cardinals would disagree. With a total of 2,369 games played, the records are tipped in the favor of the Cardinals, 1222-1147. Maybe the games between these two teams this season will help the Pittsburgh Pirates turn things around! 2016 was the first time in four years that the Pirates missed the playoffs. And the chairman Bob Nutting is not losing sleep over it. He admits that the team took a step back in their previous campaign but the talent is still there. In a recent press conference Nutting stated that by infusing talent into every level in the organization the Pirates can rise as a competitive side. Things are already getting better with Josh Bell almost fully recovered from his offseason knee surgery. John Jaso is also going to start as the primary first baseman and he’s looking forward to fill multiple roles for the Bucs. Nutting has also voiced his desire to retain the veteran core – manager Clint Hurdle, general manager Neal Huntington and right fielder Andrew McCutchen beyond their current contracts. Baseball season is here and is packed with epic matchups. You can catch all the action live as it happens. Next event featuring Pittsburgh Pirates will be Pittsburgh Pirates vs. San Francisco Giants, held at the PNC Park in Pittsburgh. As of now, the last event, Pittsburgh Pirates vs. Cincinnati Reds is scheduled for 29-Sep-19 at the PNC Park in Pittsburgh. For complete itinerary of events, please visit our website. The average price for Pittsburgh Pirates Tickets start from $38. The minimum get in price is $7 for Pittsburgh Pirates Tickets at the PNC Park, Pittsburgh. For a detailed look at ticket prices and amazing discounts, visit our website. Use Event18 as the discount code and get up to 70% discount on Pittsburgh Pirates tickets. This is a last minute opportunity to get the discounted tickets for Pittsburgh Pirates. Q:What is the Pittsburgh Pirates championship haul? A:The Pittsburgh Pirates have won five World Series crowns, nine National League pennants and nine Division championships. The Pirates last won silverware in 1992 so they will be looking to add more championships to their haul this season. To watch the Pirates' games live, get Pittsburgh Pirates Tickets from this website at the best available prices. The tickets will reach you well within time for the games. Q:What is the cell phone lot at the airport? Is something similar also available in baseball stadiums? A:Cellphone Lot is located in airports and is a parking lot where people can wait for the passengers to arrive. Its main purpose is to reduce traffic rush when multiple flights arrive at the same time and to avoid congestion at the arrival section. Parking at Cellphone Lot is usually free and it takes only a few minutes to reach the terminal. This kind of parking option is not suitable in stadiums as people will have to park for hours, especially if they are watching an entire game. If you're among the lucky fans with Pittsburgh Pirates Tickets, then there are plenty of parking spaces available. For some you have to pay but there are also free parking options. You can visit the venue's website to get parking information. Q:Who is the best player on the Pirates? A:Since there are different positions in a baseball team, every position has a player that is statistically speaking better than the others. That also applies to the Pittsburgh Pirates. Baseball is a team game and so no matter how many talented players a team has on its roster, it will not function without all of them pulling in the same direction. There are very good players on the Pittsburgh Pirates roster and you can see them all in action by booking your Pittsburgh Pirates Tickets. Q:Who is number 21 on the Pirates? A:The Pittsburgh Pirates has no number 21 on their current roster, nor will they ever have a player wearing 21 on the back of his shirt in the future. The number 21 used to be worn by the legendary Roberto Clemente and the franchise decided to retire the number after his death. A lot of players on the Pirates roster however will try to live up to the standards set by their former icon. The next season promises to be a very important one for the franchise and you can buy your Pittsburgh Pirates Tickets from our brokers via our website to see them play live. Q:Is Roberto Clementes number retired? A:Roberto Clemente is without a doubt one of the greatest baseball players. The former Pittsburgh Pirates stalwart was a two-time World Series winner and a fifteen-time All Star. He left the world aged 38. To honor his legacy the Pittsburgh Pirates have now retired his number 21. Clemente's beloved Pirates have made three playoffs appearances in the last four seasons. Book your Pittsburgh Pirates Tickets and watch one of the most famous teams in the MLB play live in the upcoming season. Q:What are the show timings of pittsburgh pirates mlb? A:You can check out the show timings from the Pittsburgh Pirates Tickets page on our website. Q:How many cheap pirate tickets can I buy with my ID? A:You can buy as many Pittsburgh Pirates Tickets as you want with your ID. Q:Can you please inform me when my cheap pittsburgh pirates tickets are dispatched? A:Yes, please provide us with your email id and we will inform you as soon as your Pittsburgh Pirates Tickets are dispatched. Q:Where can i get cheap pirates tickets online? A:Please log on to our Pittsburgh Pirates Tickets page and there you will find the tickets selling at very cheap rates. Q:I want buy pirate tickets without extra charges, how can i do that? A:The prices for the Pittsburgh Pirates Tickets selling on our site along with all our other tickets inventory are all inclusive. That means there are no extra charges for delivery or any other services. Q:Are there pittsburgh pirates discounts for students on your website? A:Sorry, there are no special discounts on the Pittsburgh Pirates Tickets on offer on our website but we assure you that these are selling at very cheap rates to begin with. Q:Are you offering pittsburgh pirates ticket discounts to press members? A:There are no special discount deals on the Pittsburgh Pirates Tickets being offered on our website. But we assure you that these tickets are selling at very cheap rates on our website to begin with. Q:How long before you charge me for the buy pittsburgh pirate tickets? A:It will take us a day to charge you for the Pittsburgh Pirates Tickets after you have booked your order on our website. Q:How much do pittsburgh pirate tickets cost? A:The relevant details along with prices are given on our Pittsburgh Pirates Tickets page. Do check it out. Q:Can i buy pirates tickets online? A:Yes, you have the option of buying Pittsburgh Pirates Tickets online. Check out the directions and place the order right away. Q:Does my pirates tickets coupon code have an expiry date? A:No, your Pittsburgh Pirates Tickets coupon code has no expiry date. Q:How can i get pittsburgh pirates ticket promo code? A:There is no special policy to get promo codes of Pittsburgh Pirates Tickets. Anybody can get them by following special directions on our page. Q:How can i get pirate tickets discounts? A:Its simple. Just follow simple directions on our page and get Pittsburgh Pirates Tickets on discounted rates. Q:Till when can i get discount pittsburgh pirate tickets? A:You can get Pittsburgh Pirates Tickets on discounted rates till the date of the event. Check out the directions and place the order right away. Q:Is the online purchase of pittsburgh pirates discount tickets reliable? A:Yes! We are certified by trusted authorities and allow the exchange of pittsburgh pirates Tickets in a safe environment. Q:Is the online purchase of discount pirates tickets safe? A:Yes! We are certified by trusted authorities and allow the exchange of pittsburgh pirates Tickets in a safe environment,. Q:Have you stared offering pittsburgh pirates tickets special deals? A:Yes! We are offering pittsburgh pirates Tickets on discounted deals. Check the details online and place your order. Q:Can i have information on pittsburgh pirate tickets deals? A:The detailed information on pittsburgh pirate tickets deals is available online. The offer of special discount codes is on! Check it out and get them! Q:Do i need to be a member for getting pirates tickets discount code? A:No, you don't need to be a member for getting pirates tickets discount code. Anybody can get online by following simple guidelines online. Q:Is there any two for one deal for pittsburgh pirate tickets discounts? A:No, we are offering pittsburgh pirate tickets discounts individually without any two for one deal. Q:Do you have any information on venues that sell pirate tickets? A:No, we don't provide any information on venues that sell pirate tickets. Q:I always find brilliant seat for pittsburgh pirates tickets from excite. I just wish to thank you people for this. A:We are happy to know that you enjoyed Pittsburgh Pirates game. Please keep visiting us, it has been an honor to serve you. Q:What is the best place to view a concert in pnc park in pittsburgh. A:The best place to get the Pittsburgh Pirates Tickets is none other than events.excite. Q:I am looking for pirates tickets. Can you help me get them? A:Pittsburgh Pirates tickets are lying in our inventory in thousands. Get them as many as you want to. Q:Do you have an eligibility criteria for getting pittsburgh pirates discount codes? A:No, There is no eligibility criteria for getting Pittsburgh Pirates Tickets. Anyone can get it. Q:Can you guide me about the cheapest place to buy pirate tickets? A:We are offering Pittsburgh Pirates Tickets on reasonably cheap rates. Check the details on our page and place your order. Q:Can i list Pittsburgh Pirate tickets on your website for sale? A:We buy Pittsburgh Pirates Tickets only from registered brokers. Q:What if I misplace my pittsburgh piartes tickets? Are they re-issued? A:Pittsburgh Pirates Tickets must be handled with great care as we do not re-issue them in any case. Q:Do i need to be a member for getting pittsburgh pirates tickets discount codes? A:No you don't need to be a member for getting discount codes of Pittsburgh Pirates Tickets. Anybody can get them by following the directions provided. Q:Is there any expiry date for pittsburgh pirates promo codes? A:Promo codes for Pittsburgh Pirates Tickets are valid for discounts before the date of the event. Q:Are there any taxes on pittsburgh pirates tickets kids? A:Taxes on Pittsburgh Pirates Tickets are included in their price published online. There are no additional charges. Q:Where local can we buy pittsburgh pirate tickets? A:You can get Pittsburgh Pirates Tickets on our website. Order them with special discount offers and get them delivered at your doorstep. Q:How am i supposed to get discount codes pittsburgh pirates tickets? A:You can take help from our live operators for getting discount codes of Pittsburgh Pirates Tickets. Q:What is the eligibility criteria for getting pittsburgh pirates tickets discount code? A:There is no eligibility criteria for getting discount codes of Pittsburgh Pirates Tickets. Anybody can get them by following simple guidelines online. Q:How can i pay for pirate tickets? A:You can pay for pirate tickets by American Express, Visa, Master Card and Discovery.